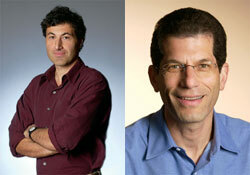 HP’s Todd Bradley and Palm’s Jon Rubinstein took the stage at Fortune Magazine’s Brainstorm tech conference. As one would expect, the focus was on HP’s plans for the future of webOS. 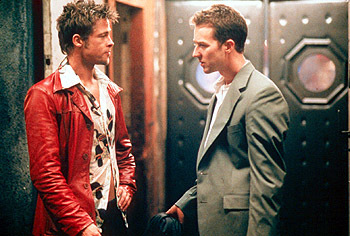 Bradley indicated the company’s thinking post-acquisition has been, “how do we proliferate webOS of a family of devices“. HP has plans to release a Windows based slate this fall. They do have plans to bring webOS to printers, slates and of course smartphones. No dates or confirmation of new hardware was announced although Jon Rubinstein confirmed that Palm has “a great roadmap in place“. Rubinstein also indicated that webOS 2.0 is coming later this year. When questioned about whether a webOS slate would include support for Flash, Rubinstein indicated Palm is working with Adobe and testing Flash with webOS. The event also had it’s Oprah moment, with Todd Bradley informing the crowd they would all receive a free AT&T Palm Pre Plus with 90 days of free service. 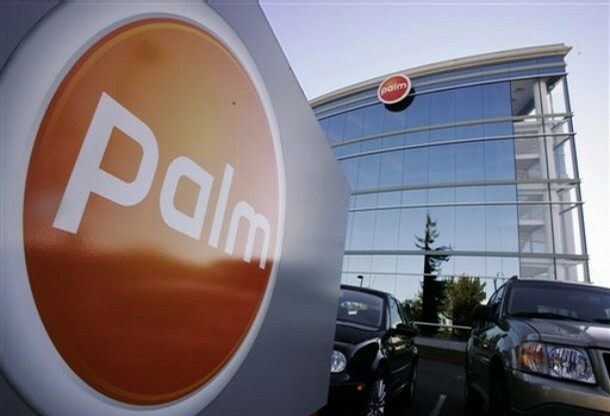 Rumor: Palm Shake-up, Rubinstein To Be Replaced? 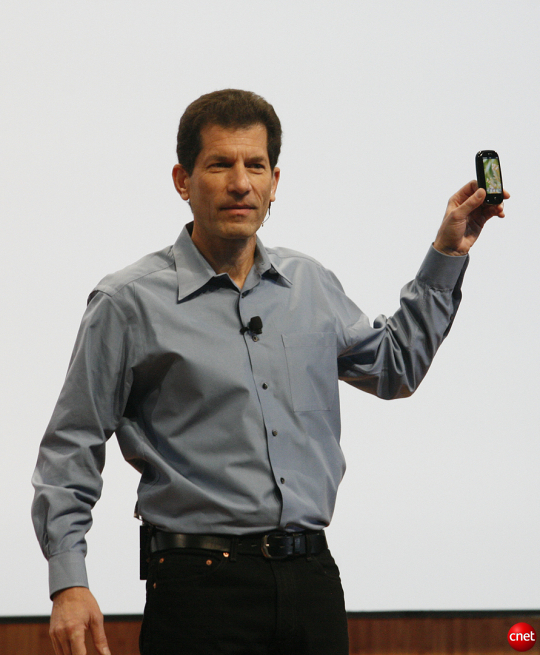 RUMOR: We’ve tagged this heavily as rumor, but TechCrunch is reporting that “according to industry sources” a shakeup at Palm is imminent and CEO Jon Rubinstein might be replaced. TechCrunch has reached out to Palm for a comment. This comes on the heals of news that Caitlin Spaan, Palm’s vice president of carrier marketing will be leaving the company. Spaan has been with Palm for 14 years. We wish her the best in her future endeavors. As soon as we get an update or clarification on this story, we’ll update this space. It seems late in the game to make such a major move and one would think it would have a detrimental affect on morale at Palm. Just yesterday, the Financial Times had a feature piece on Palm where Rubinstein was quoted as saying, ” I believe Palm can survive as an independent company. We have a plan that gets us to profitability.” That doesn’t sound to us like someone ready to walk out the door. Let’s hope this gets sorted out sooner than later. Palm today announced that webOS 1.4 would be available as a free over-the-air update to all Palm webOS device owners sometime in February. 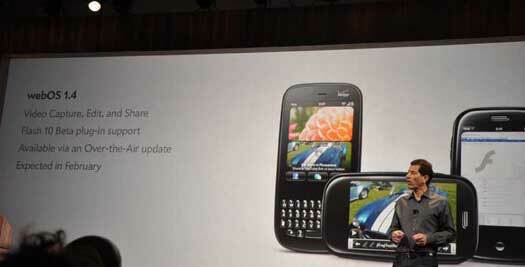 webOS 1.4 will offer support for video recording, editing and sharing. Another highlight of webOS 1.4 will be support for Flash content. (Note: Confirmed for Palm Pre, we’re not sure about Palm Pixi). Palm is expected to open the Palm Developer Program to the public later this month, marking an end to the beta that’s helped shape the program. The developers who have taken part in the beta are being rewarded for their efforts in many ways. The company has sent out letters to developers thanking them for all their efforts and including a $100 Amazon gift certificate in time for the holiday season. 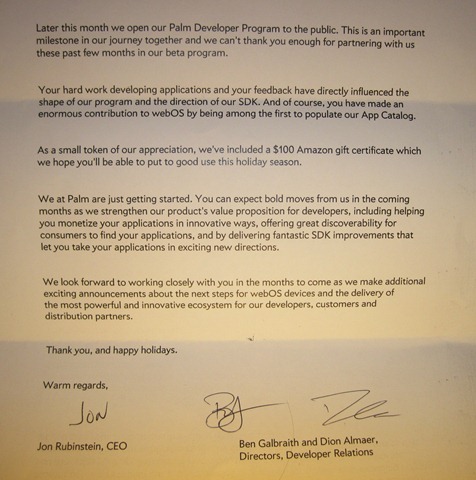 While I’m sure developers will appreciate the gift certificate, receiving a letter from the CEO of Palm along with Ben Galbraith and Dion Almaer provides no better indication of Palm’s dedication to the developer community. Well deserved and well done. On Sunday September 13th, the guys from Engadget will film their first ever live show and they’ve got one helluva first guest. 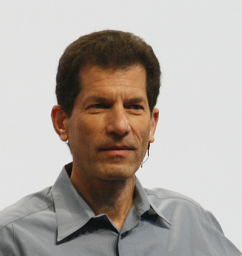 Palm’s CEO Jon Rubinstein will join them for what should be a very interesting interview. Expect discussions about the Palm Pre, webOS, Palm Pixi and the cat & mouse game that is Palm Pre syncing in iTunes. The show is being taped before a live audience at the Tishman Auditorium at Parsons The New School for Design. The venue seats up to 450 and tickets are free. Be aware that tickets are first come, first-served, so arrive early. The show begins at 5pm EST. For those who cannot be in attendance, the video will be available in iTunes, Zune Marketplace amongst others.